The Brother Fax-8360P is a laser monochrome printer that is suitable for home office or for personal use. 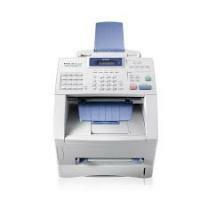 It is a multifunction printer that can possesses printing, copying and fax capabilities. The Brother Fax-8360P printer is lightweight and easily movable. It is 37.59 cm in width, 44.19 cm in depth, and 32.25 cm in height. As it has a weight of 12.02 kg, it is easily movable. Its input tray can hold up to 500 sheets while its output tray has a media capacity of 150 trays. It can print on a variety of media types which include plain paper, envelopes, recycled paper and transparencies. The Brother Fax-8360P needs only power consumption of 940 watts per kilowatt hour. This printer can copy at a speed of 14 pages in a minute and at a resolution of 600 x 300 dpi. The fax of this machine works at a speed of 33.6 Kbps and its error correction feature prevents errors from getting transmitted. Brother Fax-8360P Toner Cartridges are low cost and give a good page yield. The Brother Fax-8360P is a highly affordable printer and is good for home office or for personal use. Its initial cost and the cost of maintaining Brother Fax-8360P Toner Cartridges is quite low. Also these toner cartridges are high yield. This printer can print on a variety of media types and its power consumption in the sleep mode is very less. But this printer can not do colour printing and it does not possess a scanner. Although it lacks in certain aspects but overall it is a very good choice. Q. Does the Brother Fax 8360p printer support scanning? A. Unfortunately, this printer does not support scanning. Q. The toner indicator of my Brother Fax 8360p printer is flashing on and off. What does this indicate? A. If toner indicator flashes on and off, it indicates that the toner level in your Brother Fax 8360p Toner Cartridges is low. At this time, you should consider buying new cartridges. Q. If I order a multipack of Brother Fax 8360p Toner Cartridges today, how much time will you take to deliver it? A. All our orders are delivered by Fastway Couriers. Approximately 90% of our orders received before 12 noon daily are despatched same day and delivered on a 1 to 3 delivery day basis. Fastway couriers will deliver between the hours of 9am - 5pm (Monday - Friday). However, if your need is urgent, you can call us on 048 30833221. Q. I am planning to purchase Brother Fax 8360p Toner Cartridges in bulk. Can you provide guidelines on storing these cartridges? Store toner cartridges in a room with relatively low humidity. Do not remove the toner cartridge from its package until ready for use. Make sure not to expose them to too much light. Q. Where can I find the serial number for my Brother Fax 8360p printer? A. The serial number of this printer is located on the back of the unit on the rating plate. Q. I just replaced the cartridges inside my Brother Fax 8360p printer but I still see the "Toner Empty" message on the LCD. What should I do? Remove the drum unit from the MFC and shake it gently, then re-install the drum unit. Q. Do you provide XL size Brother Fax 8360p Toner Cartridges for the Brother printer? A. No, we do not have any XL size cartridges for the Brother Fax 8360p printer on this site. Q. Will I get the same number of printed pages from a compatible Brother Fax 8360p Toner Cartridges as I used to get using the original ones? A. You will get at least the same number of printed pages, and often more, from the compatible cartridges as you will get from original (OEM) cartridges. Q. When is the best time to replace a Brother Fax 8360p Toner Cartridges? A. If possible you should replace your cartridges before they run out. This will stop ink from drying in the print head between replacement and it will be easy for you to carry out the process. Q. Can I use my compatible Brother TN6600 cartridges with the Brother MFC series printer? Q. How many cartridges does Brother Fax 8360p use? What is the estimated quantity of ink in the cartridge? A. Brother Fax 8360p is a mono laser printer that uses only single black colour cartridges for their printer. The quantity of ink supplied depends upon whether the cartridges supplied are the original ones or the compatible version. Our compatible Brother Fax 8360p toner cartridges contain more ink than the original ones do. Q. I do not have a debit or credit card! How can I make a payment? A. If you do not have debit or credit card, nothing to worry about. You can still make the payment using the PayPal. If you return any item the amount will be credited back to your PayPal account.